Asthma is the most common chronic lung disease among children in the U.S. and recent data from Better Health Partnership (BHP) shows it hits certain Cleveland neighborhoods hard. BHP is a group of healthcare providers and other organizations aiming to improve health outcomes in Northeast Ohio. 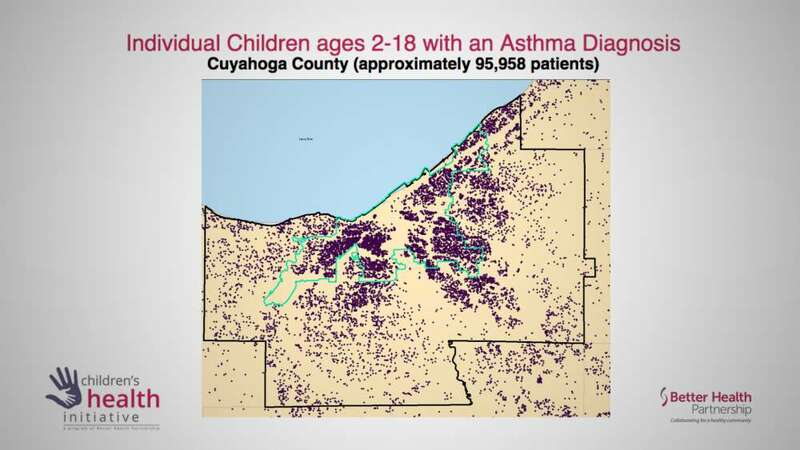 Its 2018 Children’s Health Report includes maps illustrating asthma cluster zones in certain parts of Cuyahoga County. The maps were created based on data the organization received from its network of providers caring for 96,000 children in Cuyahoga County between 2016 and 2017. Cleveland neighborhoods including parts of Broadway-Slavic Village and Clark-Fulton came up as hot spots where 21 percent or more of the children in the data set had an asthma diagnosis. Compare that with suburbs like Seven Hills and Brooklyn Heights where just 8.5 percent of the children had an asthma diagnosis. Both Broadway-Slavic Village and Clark-Fulton neighborhoods have a large minority population, as well as many low-income families. According to the Centers for Disease Control and Prevention, both black and Puerto Rican children have higher rates of asthma, as well as children from low-income families. Researchers hope to use the neighborhood level data and comparisons across communities to help the public health community better understand and address environmental factors that may be fueling the disparities. Two-year old Kamaya Lewis lives in Glenville, a neighborhood with a high rate of asthma according to the BHP report. On a Monday afternoon in early October, Lewis sat in a bed in the emergency room of UH Rainbow Babies and Children’s Hospital taking an aerosol treatment to help her breathe. According to the ER director Dr. Haitham Haddad, she had suffered a severe asthma attack. Kayama Lewis’s mom said it was hard to see her baby in distress. “I’d rather take the pain [myself],” said Sharmain Singleton. The mist coming through the mask that covered Lewis’s face contained albuterol, a medicine that when inhaled helps patients breathe. Lewis was one of two severe asthma cases that Haddad saw in the pediatric ER that afternoon. Viruses are a common cause of attacks in young children, he said. Besides viruses, other triggers for asthma attacks include things like dust, mold, pollen, pet dander and temperature changes. Irritants like cigarette smoke and chemical fumes can also be problematic. Experts say more emphasis needs to be put on developing programs to help at-risk families manage asthma and prevent costly hospitalizations. In Ohio, the Department of Medicaid spent over $64 million on pediatric asthma in 2017, including over $5 million on ER visits and over $13 million on hospitalizations. Seventeen-year-old Mary McCornell, who is biracial and grew up in Cleveland’s Hough and Glenville neighborhoods, says that over the years environmental factors made it difficult to control her asthma. “When you live in a place like Cleveland, you're going have a lot different problems than let's say a white child that lives in a middle-class neighborhood,” said McCornell. “There is always somebody smoking outside. There is always some trash in the street. There are always different environmental things that are there for me that are not there for other people. So, it might take more for me to feel better,” she said. McCornell now visits the doctor every two weeks to get shots to control her asthma. She says that after a year of the treatment, her quality of life is much better. Dr. Dorr Dearborn of Case Western Reserve School of Medicine says more needs to be done to help at-risk children control their asthma. He says most hospitalizations for childhood asthma are preventable. “Hospitalization for childhood asthma is a failure in medical care,” said Dearborn. Dearborn says two things are necessary to provide medical care to prevent unnecessary hospitalizations. Families need proper training and support so that children can better comply with treatment. Dearborn says families also need help mitigating things in the home environment that can trigger asthma attacks. “One could approach this and not only make it cost effective, but decrease the morbidity across the whole population,” he said. Dearborn has been working for decades to fuel efforts to fund home visits for pediatric asthma patients in Cleveland. The goal is to have community health workers help parents and other caregivers get rid of triggers that cause attacks and lead to costly ER visits and hospitalizations. While home visiting programs have proven cost effective in places like Boston, stable funding for such programs in Cleveland has not materialized. Dr. Donald Wharton of Ohio Medicaid says it will take a multifactorial approach to design better ways to help manage the costly problem of childhood asthma. “We encourage the collaboration of all stakeholders, including providers, hospital systems, payers and health plans, community leaders, school systems and legislators, to continue to align our efforts addressing this problem,” he said.